Federal health regulators are warning doctors and patients that popular heartburn drugs like Nexium and Prilosec may cause bone fractures when used for more than a year. The Food and Drug Administration said Tuesday several studies have shown increased risk of hip, wrist and spine fractures in patients using drugs that block stomach acid. The agency said a half-dozen studies tracked fractures in patients older than 50 when the drugs were used between one and 12 years. The agency says the association between the drugs and bone fractions is still not understood and it plans to investigate further. The drugs are known as proton pump inhibitors and include both prescription drugs like AstraZeneca's Nexium and Takeda's Prevacid as well as over-the-counter medicines like Prilosec OTC, which is made by Procter & Gamble. 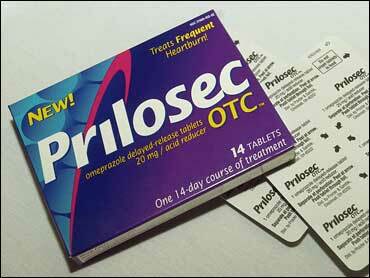 Are Nexium and Prilosec Too Popular? Combined U.S. sales for the drugs totaled $13.6 billion last year, according to data tracker IMS Health. The drugs were the third best-selling group of prescription drugs in the U.S. The FDA says all the drugs will carry new warning labels about the potential risk. "Health care professionals should consider whether a lower dose or shorter duration of therapy would adequately treat the patient's condition," said FDA's Joyce Korvick in a statement.